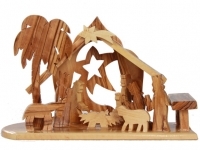 A perfect and beautiful wooden nativity scene shows the presence of baby Jesus, Mary, Joseph, three Wise Men, a Shepherd and manger along with three animals that include a sheep, a cow, and a donkey. Each nativity shows elegant detail of the birthplace of Jesus. Nothing can be more precious to Christians than this Holy scene. That is why HolyLand-Gifts offers all Holy gift seekers an option of fine quality wooden-crafted nativity scenes designed and crafted by expert and highly skilled Bethlehem Christian artisans, who make these Nativities to bring you closer to Christ. So bring infant Jesus, his mother Mary, and Joseph to your home with a wooden nativity set.. To get the best and stunning nativity sets in different styles and designs, spend a few moments browsing our website and grab a unique gift that has been made only for you. Our unique gifts are perfect for anyone wanting to feel a special connection to Bethlehem, the birthplace of Jesus. My order was placed online from the website. I must say how very happy I am with all the purchases.I appreciate the fast receipt of the order. Thank you Andrew!! !